If you like Irish Soda Bread, you’ll like this hearty, seedy quick bread made with whole spelt flour. I found this recipe on my pack of Gilchesters Organics “Stoneground Organic 100% Whole Spelt”, a “nutritionally rich, flavoursome flour.” The resulting loaf was not pretty. The crust was a bit tough and the dough didn’t rise as much as I expected. And yet, I really liked it. The bread was dense without being brick-like. It demands to be accompanied with something salty, such as butter or avocado and salt. 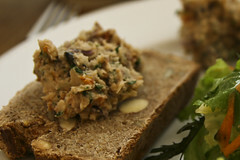 I really liked it with a bit of cannellini bean pate (one of my tricks from Rachel Demuth). The best part of this bread is that it really takes only 3 minutes to prepare. Although it requires yeast, there’s no kneading required. It’s a good starting point if you’re experimenting with wholemeal spelt flour. 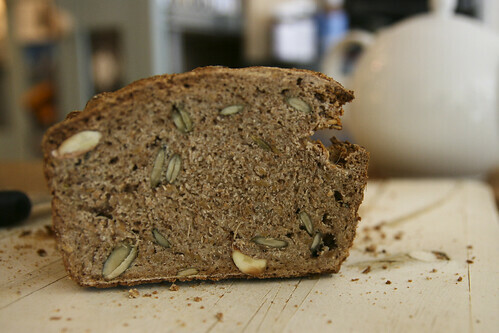 For a more sandwich-style bread, check out the wholemeal spelt bread I posted a few weeks ago. You can use whatever seeds or nuts you have on hand to make this recipe. I used almonds, pumpkin and flax seeds. Preheat oven to 200 C / 390 F. Combine all the ingredients, adding the water last. Mix well and turn the dough into a greased loaf tin. Put straight into the oven and bake for an hour. Remove the loaf, turn it out of the tin and then return it to the oven without the tin for another 5-10 minutes. Cool! I’ve never tried baking with spelt flour before. This looks tasty. This recipe looks very good. The bread in the picture looks great. I would love to try. Thanks for the recipe. If you try it, do let me know how it turns out!